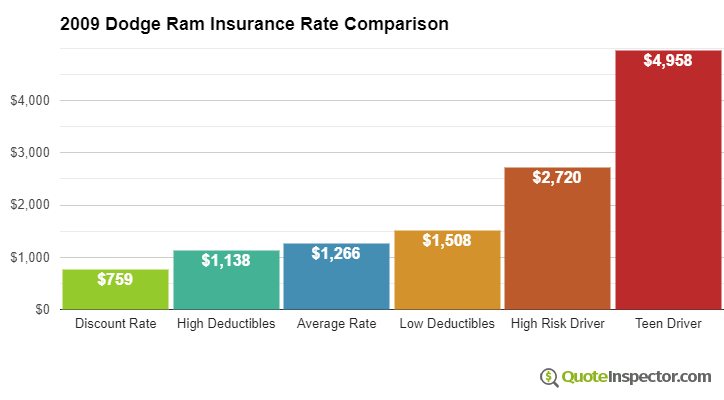 Average insurance rates for a 2009 Dodge Ram are $1,266 a year for full coverage. Comprehensive insurance costs approximately $234, collision insurance costs $328, and liability costs around $524. Buying a liability-only policy costs as low as $580 a year, and high-risk insurance costs $2,720 or more. Teen drivers receive the highest rates at up to $4,958 a year. Rate data is compiled from all 50 U.S. states and averaged for all 2009 Dodge Ram models. Rates are based on a 40-year-old male driver, $500 comprehensive and collision deductibles, and a clean driving record. Remaining premium consists of UM/UIM coverage, Medical/PIP, and policy fees. For a middle-aged driver, prices range range from as low as $580 for basic liability insurance to the much higher price of $2,720 for a high risk driver. These differences show why everyone should compare prices using their specific location and risk profile, instead of making a decision based on price averages. Shoppers have options when shopping for the best price on Dodge Ram Pickup 1500 insurance. They can either waste time driving around to get rate comparisons or leverage the internet to compare rates. There is a right way and a wrong way to shop for insurance and we’ll show you the absolute fastest way to compare rates on a Dodge and get the best price possible. If you have a current car insurance policy or need a new policy, you can follow these tips to shop for the lowest rates while maximizing coverage. This article will introduce you to the best way to quote coverages and some tips to save money. Consumers just need to understand the tricks to get comparison rates online. Car insurance is not cheap, but there could be available discounts that can drop the cost substantially. Some discounts apply automatically when you purchase, but some must be asked about before they will apply. If you’re not getting every credit possible, you’re paying more than you need to. Paperwork-free – Some insurance companies will discount your bill up to fifty bucks for buying your policy on their website. Pay Upfront and Save – By paying your policy upfront instead of paying each month you may reduce your total bill. Multi-car Discount – Buying coverage for more than one vehicle on the same insurance policy can get a discount on all vehicles. Use Seat Belts – Buckling up and requiring all passengers to wear their seat belts could cut 10% or more off the personal injury premium cost. Low Mileage – Low mileage vehicles could qualify for better rates on cars that stay parked. Homeowners Savings – Simply owning a home can help you save on insurance because of the fact that having a home is proof that your finances are in order. Air Bag Discount – Vehicles with factory air bags or automatic seat belts can qualify for discounts up to 30%. Braking Control Discount – Vehicles equipped with ABS or steering control prevent accidents and will save you 10% or more. Theft Prevention Discount – Vehicles with anti-theft systems prevent vehicle theft and will save you 10% or more. It’s important to understand that most credits do not apply to the entire policy premium. Some only apply to the cost of specific coverages such as comp or med pay. Even though it may seem like you could get a free insurance policy, insurance companies aren’t that generous. Any qualifying discounts will reduce your premiums. It’s a good idea to ask each company which discounts they offer. Savings may not be available everywhere. Most companies allow you to get coverage price quotes on the web. The process doesn’t take much effort as you just type in your coverage information into the quote form. When complete, the company’s rating system orders credit information and your driving record and gives you a price quote. Online price quotes helps simplify price comparisons, but the time it takes to visit several different sites and type in the same information is repetitive and time-consuming. But it’s very important to do this in order to get the lowest insurance coverage rates. The smarter way to find cheaper rates uses one form that obtains quotes from many companies. This type of form saves time, reduces the work, and makes rate comparisons much easier to do. Immediately after you send the form, it is rated with multiple companies and you can pick your choice of the pricing results. If a lower price is quoted, it’s easy to complete the application and buy the new coverage. The entire process takes just a few minutes to complete and may result in a nice savings. To quickly find out what other companies charge, simply click here to open in new window and complete the simple form. If you currently have coverage, we recommend you duplicate the coverages as shown on your current policy. This helps ensure you are getting a price comparison using the same coverage and limits. When buying the best insurance coverage, there really is not a single plan that fits everyone. Every situation is different. For instance, these questions could help you determine if you could use an agent’s help. Does my 2009 Dodge Ram Pickup 1500 need full coverage? Is pleasure use cheaper than using my 2009 Dodge Ram Pickup 1500 to commute? If you can’t answer these questions, then you may want to think about talking to an agent. If you don’t have a local agent, complete this form. It’s fast, doesn’t cost anything and can help protect your family. Learning about specific coverages of your car insurance policy helps when choosing the right coverages for your vehicles. The terms used in a policy can be confusing and nobody wants to actually read their policy. Comprehensive insurance will pay to fix damage OTHER than collision with another vehicle or object. You need to pay your deductible first then your comprehensive coverage will pay. Comprehensive insurance covers things like fire damage, hail damage, damage from getting keyed, a broken windshield and theft. The maximum payout you can receive from a comprehensive claim is the cash value of the vehicle, so if it’s not worth much more than your deductible consider removing comprehensive coverage. Liability coverage can cover damage that occurs to other people or property. This coverage protects you from claims by other people. Liability doesn’t cover your injuries or vehicle damage. Liability coverage has three limits: bodily injury for each person, bodily injury for the entire accident, and a limit for property damage. As an example, you may have policy limits of 50/100/50 that means you have a limit of $50,000 per injured person, a per accident bodily injury limit of $100,000, and a limit of $50,000 paid for damaged property. Occasionally you may see a combined limit which provides one coverage limit rather than limiting it on a per person basis. Liability insurance covers things like emergency aid, attorney fees and repair bills for other people’s vehicles. How much liability should you purchase? That is your choice, but it’s cheap coverage so purchase as large an amount as possible. Collision coverage covers damage to your Ram Pickup 1500 resulting from colliding with an object or car. You have to pay a deductible then the remaining damage will be paid by your insurance company. Collision coverage pays for things such as crashing into a building, backing into a parked car, colliding with a tree and damaging your car on a curb. This coverage can be expensive, so you might think about dropping it from older vehicles. Another option is to raise the deductible to get cheaper collision coverage. Your UM/UIM coverage provides protection from other drivers when they are uninsured or don’t have enough coverage. It can pay for injuries sustained by your vehicle’s occupants and damage to your Dodge Ram Pickup 1500. Since many drivers carry very low liability coverage limits, it doesn’t take a major accident to exceed their coverage limits. For this reason, having high UM/UIM coverages is a good idea. Most of the time these limits are similar to your liability insurance amounts. Insureds switch companies for a variety of reasons including an unsatisfactory settlement offer, delays in responding to claim requests, lack of trust in their agent and even questionable increases in premium. Whatever your reason, choosing a new insurance company can be easier than you think. As you shop your coverage around, never reduce needed coverages to save money. There have been many situations where someone sacrificed comprehensive coverage or liability limits only to find out that the small savings ended up costing them much more. Your strategy should be to find the BEST coverage for the lowest price while not skimping on critical coverages. You just read some good ideas how you can get a better price on 2009 Dodge Ram Pickup 1500 insurance. The key thing to remember is the more price quotes you have, the better your comparison will be. Drivers may discover the best prices are with the least-expected company.